Say hello to Bear! 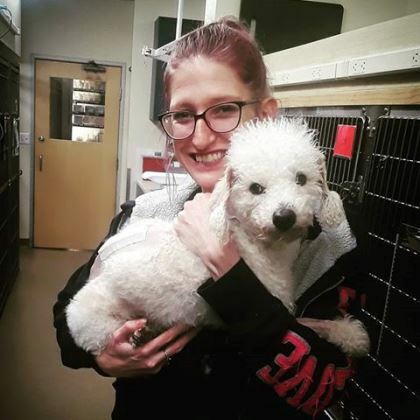 Bear is a four-year-old poodle mix who presented to Veterinary Specialty Hospital in Sorrento Valley after his mom found him dragging his back legs. Upon consultation, VSH’s neurology team quickly assessed Bear as having intervertebral disc disease or IVDD. If not treated quickly, IVDD can quickly lead to paralysis. Bear only had a small window to get surgery before his condition could rapidly decline. Bear and his mom, Amber, are best friends. Bear came into her life during an extremely difficult time and has provided her with unconditional love and support for the last four years. Amber spent everything she had getting Bear diagnosed, and when she found out he needed surgery she was absolutely devastated. She couldn’t imagine losing her best friend simply because she couldn’t afford his care, but also had no idea where she could come up with the funds in such a short amount of time. After talking with the staff at VSH, Amber quickly applied for FACE. After reviewing Bear’s application, we were able to make a pledge towards his emergency surgery! We’re so excited to share with all our supporters who make FACE’s work possible that Bear’s surgery was a total success and he got to return home with his mom yesterday! Thank you all for helping us save pets like Bear every day!